The Ryan Express is the most exciting pitcher to ever take the mound in Major League Baseball history. During his 27-year career he pitched for four different teams: the New York Mets, California Angels, Houston Astros and Texas Rangers. His 100+ MPH fastball was his trademark. Nolan Ryan was an eight-time MLB All-Star, and his 5,714 career strikeouts rank first all time in baseball history. Nolan Ryan is the all-time leader in no-hitters with seven. Nolan Ryan was a first ballot Baseball Hall of Fame inductee in 1999 with 98.8% of the vote. 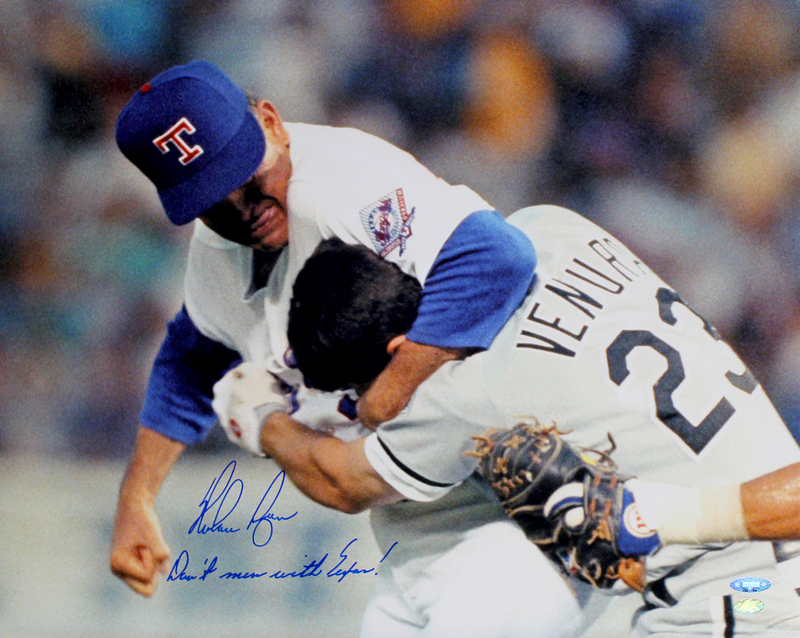 This Texas Rangers 16x20 photo picturing the famous Nolan Ryan and Robin Ventura fight has been hand signed and inscribed "Don't Mess With Texas" by Nolan Ryan. Each autograph is guaranteed authentic, and includes an individually numbered, tamper-evident TRISTAR Authentic hologram.